In this publication, we draw on experiences from Peru and around the world to characterize the key elements of a successful protection-production compact (PPC). 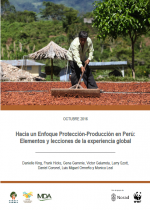 Our critical review of international experience has allowed us to extract these elements and identify best practices, important lessons, and potential risks that should be considered as strategic plans covering each of these elements are developed for the Peruvian context. The analysis in this publication lays a clear conceptual foundation for the work ahead, which is as urgent as it is ambitious.